The Tussey Mountain Amphitheater provides an outdoor music experience like no other in Central PA. The mountain is unique with its beautiful sunsets overlooking Happy Valley and undeniably amazing acoustics created by the mountainous terrain of the ski slopes. The gentle slope of the amphitheater makes for great sight lines and maximum visibility no matter where you are in the venue. Located in Boalsburg, PA, mere minutes away from downtown State College, the Amphitheater is easy to get to and is along the CATA bus B route. We are also environmentally conscious with an extensive recycling program and efforts to cut down on concert waste. All we ask is that you participate and put your recycling in the proper bins located throughout the venue. The Amphitheater is a fan favorite, as the community has voted it Gold (2013, 2014, 2015) and Silver (2016) medals in the "Best Place to See Live Music" category in State College Magazine! Through the years the Tussey Mountain Amphitheater has entertained Happy Valley with performances by Bob Dylan, Willie Nelson, The Beach Boys, Widespread Panic, Gov't Mule, Def Leppard, Jefferson Starship, Rusted Root, Toad the Wet Sprocket, Third Eye Blind, Our Lady Peace with local artists Pure Cane Sugar, Velveeta, My Hero Zero and many more. Our entertainment calendar features the best of rock, blues, country, jazz, classical and funk. 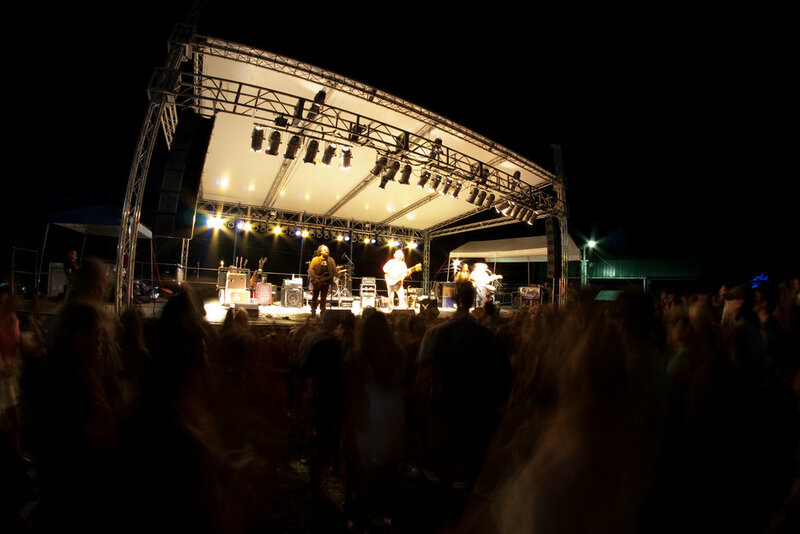 Be sure to put the Tussey Mountain Amphitheater on your concert radar for summer 2016 shows. The Tussey Mountain stage is 40’ x 24’. Complete with two fully covered wings (12’ x 16’) and a loading dock at truck level. There is plenty of room back stage to accommodate any size vehicle. There are stairs on either side of the stage for easy access. The roof trussing in place can handle 1,000lbs. The Tussey Mountain Amphitheater offers unique accommodations for artists. Our winter Snowsports School serves as the summer Greenroom for performers with amenities such as restrooms, comfy couches, food and drinks, all only steps from the stage. This space is great for pre-show practice sessions. For traveling performers, Aikens Cabins provides a comfortable place to hang out and spend the night, with a full kitchen, living room and two bedrooms in each cabin. Each cabin is equipped with DirecTV. The cabins are tucked in to the edge of Rothrock State Forest with beautiful wooded areas surrounding the cabins. The cabins are located across the street from the Amphitheater.